A clean, focused writing environment where your works of any kind enjoy instant auto-save, real-time cloud syncing and flexible export formats. These make Inspire the most elegant way to write. Here, you just need to enjoy the simple, distraction-free markdown writing environment that Inspire creates to boast your productivity. – Instant auto-save, real-time cloud sync and flexible export formats make your writing of any kind pleasant and elegant. 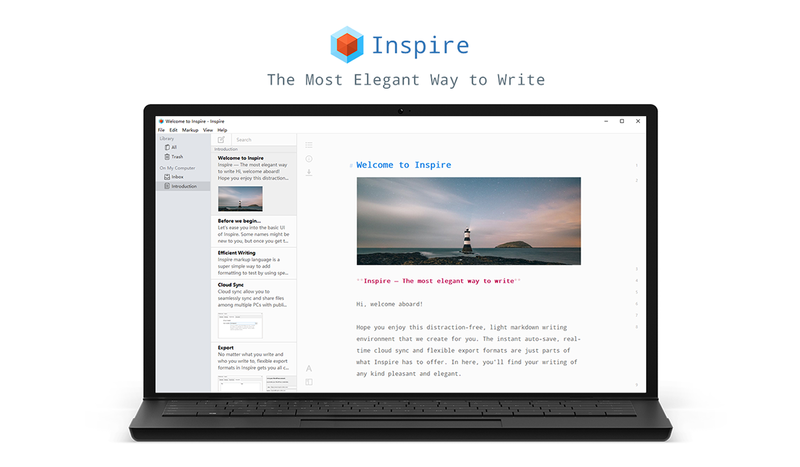 – Inspire is designed for maximum productivity. The distraction-free, light, clean-interface allows you to focus on your writing. – The markup shortcuts with syntax highlighting give you an immersive experience without giving away readability. Markup based editor and full keyboard support allow you to say goodbye to the mouse. It makes you wonder what coders are thinking when they create software. For example, when you view the list of saved notes the whole text of each document is shown under the titles on the left side. You have to cursor down through miles of text to find the document you want to edit. The text for each note is shown in the main window. Why would you want to see the complete text again in the title list?